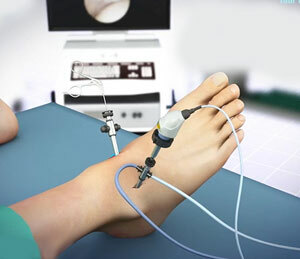 To operate in and around the damage ankle area, a surgical procedure called ankle arthroscopy is used. For the procedure, a fiber-optic surgical camera and surgical tools are used. Ankle arthroscopy can heal many different types of ankle problems and it takes less time for the patient to recover than the traditional surgery. What are the Indications of Ankle Problem? Swelling and pain in the ankle area. Unable to move the ankle and sometimes stiffness. Medical issues like the patient can’t control the ankle voluntarily. Before surgery: It is advised that you don’t eat or drink anything on the day of surgery. Inform your doctor about all the medications that you take. The surgeon will ask you not to take any blood thickening agents like aspirin. Procedure: Before the surgery, the surgeon will inject local anaesthesia in the patient’s body to put them to sleep or regional anaesthesia to numb the ankle area. After this, the incisions are made and small tubes are placed in the ankle for the doctor to examine through camera. Once the surgery is done, the doctors will remove all the tubes. The incisions are stitched back. After surgery: If there is swelling, the ankle should be elevated and iced. Painkillers are given if there is excessive pain. The incision area should be kept clean and dry for the wounds to get heal faster. Some patients are advised to wear weight with crunches while others are placed in immobilizer for a few weeks. Bleeding from the blood vessels that are cut during the surgery. People suffer from nerve damage after the procedure. The overlying skin of the ankle gets numb for a period. Infection is a major risk involved.